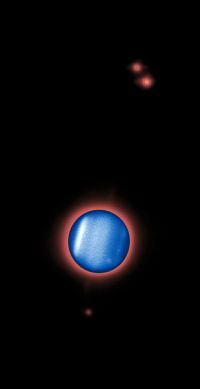 The Isaac Newton Group of Telescopes (ING) is owned and operated jointly by the Science and Technology Facilities Council (STFC) of the United Kingdom, the Nederlandse Organisatie voor Wetenschappelijk Onderzoek (NWO) of the Netherlands and the Instituto de Astrofísica de Canarias (IAC) of Spain. The first ground-layer adaptive optics system in the world that will be used for general astronomical observations has been commissioned at the William Herschel Telescope on the island of La Palma. The system, which was developed by the Isaac Newton Group of Telescopes, in collaboration with scientists from Durham University (UK), the University of Leiden (Netherlands) and the ASTRON institute (Netherlands), will permit astronomers to study celestial objects in much greater detail. The ground-layer adaptive optics system, or GLAS as it is called, works with a high-tech pulsed laser. The laser beam is projected from a small telescope mounted behind the secondary mirror of the William Herschel Telescope, producing an artificial star in the sky at an altitude of 15 kilometres. The light coming from the artificial star is detected by a sensor that measures the atmospheric distortions. This information is used at a rate of several hundred times per second to shape a rapidly adjustable deformable mirror to take out the adverse effects of atmospheric turbulence. The somewhat low altitude of the artificial star implies that air turbulence nearer the ground is preferentially illuminated and corrected, and therefore it is usually referred to as ground-layer adaptive optics. The importance of such a laser adaptive optics system goes beyond the immediate scientific interests at the William Herschel Telescope. Scientists are currently developing future extremely large telescopes that will have mirror diameters of thirty or even forty meters. These future huge telescopes will have to rely on adaptive optics with lasers, and correction of ground-layer turbulence will be of crucial importance. This project was made possible through a grant from the Division for Physical Sciences of the Netherlands Organisation for Scientific Research, with assistance from the OPTICON network funded by the European Union. The William Herschel Telescope is part of the Isaac Newton Group of Telescopes (ING). The ING is owned and operated jointly by the Science and Technology Facilities Council (STFC) of the United Kingdom, the Nederlandse Organisatie voor Wetenschappelijk Onderzoek (NWO) of the Netherlands and the Instituto de Astrofísica de Canarias (IAC) of Spain. The telescope is located in the Spanish Observatorio del Roque de los Muchachos on La Palma, Canary Islands, Spain. The international observatory is operated by the Instituto de Astrofísica de Canarias (IAC). Caption: The Ground-Layer Adaptive Optics system in use at the William Herschel Telescope. Credit: Javier Méndez. [ JPG | TIFF ]. 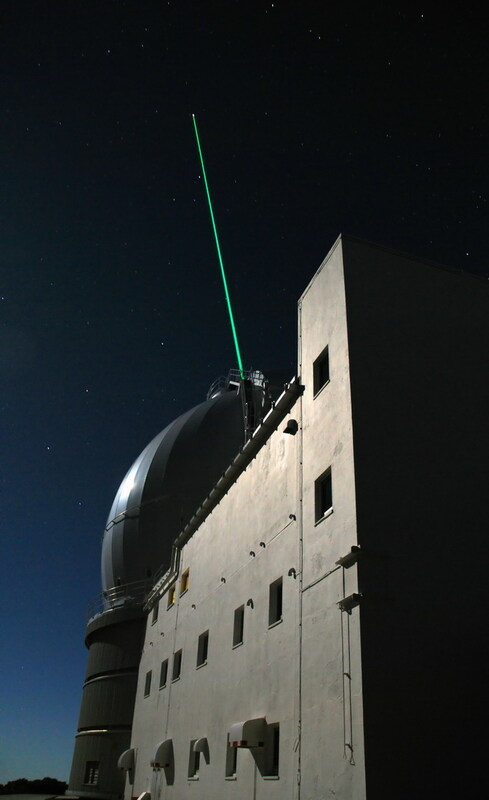 Caption: The GLAS laser beam produces a bright star-like beacon at an elevation of some 15 kilometres above the observatory. This beacon is used to sense the wavefront distortions due to the atmosphere, which are subsequently corrected for with the Adaptive Optics system. Credit: Tibor Agócs. [ JPG | TIFF ]. 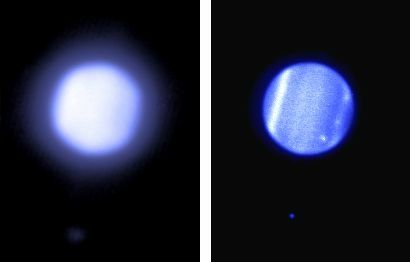 Caption: Comparison of H-band images of Uranus with GLAS and adaptive optics correction off (left) and on (right). The faint point at the bottom is the moon Miranda, which has moved aproximately 0.7 arcseconds between the times both images were taken. Credit: René Rutten, Javier Méndez and the GLAS commissioning team. [ JPG | TIFF | JPG with text | TIFF with text ]. Caption: The William Herschel Telescope was pointed towards Uranus, 226 years after the telescope's namesake first discovered the planet. This image, taken in the near infrared with the GLAS adaptive optics system, reveals the planet's atmospheric bands and clouds, and three of its moons (Umbriel, Ariel and Miranda from top to bottom). The smallest of the clouds measures less than 0.2 arcseconds across. Also faintly visible are the planet's rings, which are observed almost edge on for the first time in 42 years. 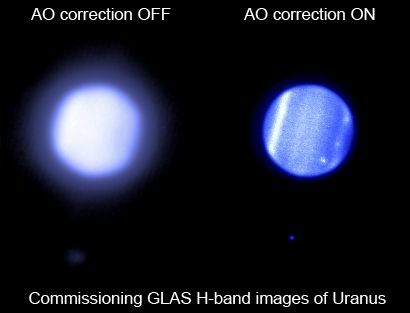 The Uranus image was taken in the H band, with the tip tilt correction provided by the 14th magnitude satellite Oberon (not visible in this image), and the high order correction from the GLAS laser system. Credit: Samantha Rix, Javier Méndez and the GLAS commissioning team. [ JPG | TIFF ]. Caption: Comparison of uncorrected and laser-corrected images (top left and top right respectively) of a region in the globular cluster M15. The increased sharpness and brightness of the stars in the right hand image demonstrate the clear enhancement in image quality. [ JPG | TIFF ]. A zoom into one small section (bottom left and right) reveals how what appears to be two stars in the uncorrected image are actually four stars. Credit: GLAS commissioning team. [ JPG | TIFF ]. Caption: Another comparison of an uncorrected (left) and laser-corrected (right) image of the globular cluster M15. The images are 5 by 6 arcseconds wide, and the laser correction improved the quality from 0.40 arcseconds to 0.16 arcseconds. Credit: GLAS commissioning team. [ JPG | TIFF ]. Caption: GLAS logo. [ JPG ]. Even the biggest and best astronomical telescopes on the highest mountains and under pristine clear skies are hampered by the Earth’s atmosphere in their endeavour to look sharply into the cosmos. Subtle variations of air temperature cause the starlight to become distorted before it reaches the telescope. There, the rapidly changing distortions result in images from far away stars and galaxies becoming blurred, which poses a severe restriction on the capability of telescopes on the ground. To counteract the disturbing effect of the earth’s atmosphere, scientists and engineers have developed techniques that allow them to measure and correct for the atmospheric distortions in an attempt to try to recover a perfectly sharp picture. A small mirror whose shape can be rapidly adjusted corrects for the atmospheric distortions. 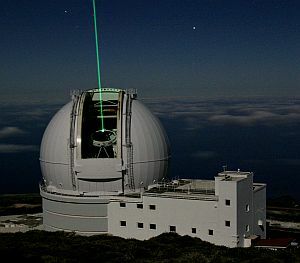 This technique is referred to as adaptive optics and is being used at a number of telescopes around the world, including the 4.2-m William Herschel Telescope on the island of La Palma, in the Canary Islands. Although adaptive optics has been in operation on a regular basis for some years, the real benefits for astronomical research can only be unleashed when the technique is used in conjunction with a laser beam that generates a point source of light in the sky. This point, or artificial star, can then be used to measure the distortions caused by the Earth’s atmosphere. Without such a laser only a very small fraction of the sky can be studied, while with a laser nearly the full sky is available for scientific studies. This provides a remarkable advantage for astronomers. It is not customary to see artificial lights at an astronomical observatory at night. Lights in general badly affect professional telescopes. The laser light used here, however, does not affect the observations because it is very well focused and works at only one very specific colour. Moreover, a system has been implemented that coordinates where all telescopes are pointing and prevents the laser from adversely affecting other telescopes. The laser beam is only visible by the unaided eye from close to the telescope building. Time exposures clearly show the green laser beam coming from the telescope. The artificial star that the laser produces is much too faint to be seen by the unaided eye, but is of course bright enough to be seen with the telescope.